Home / Entertainment / News / Politics / Trending / Is this a sign? 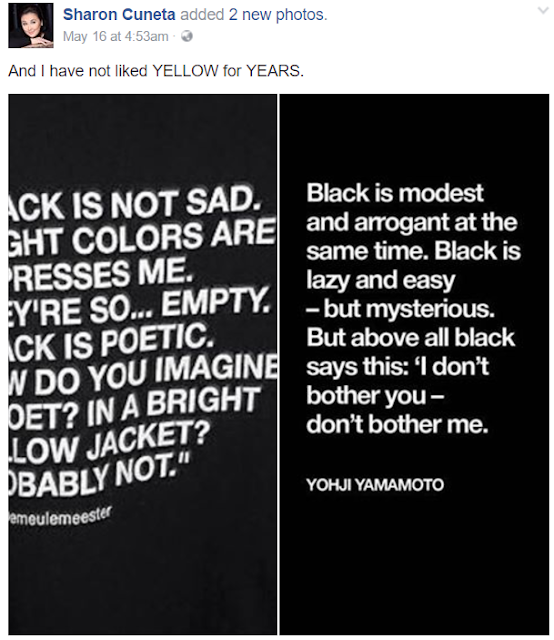 Sharon Cuneta: "I have not liked YELLOWS for years"
Is this a sign? 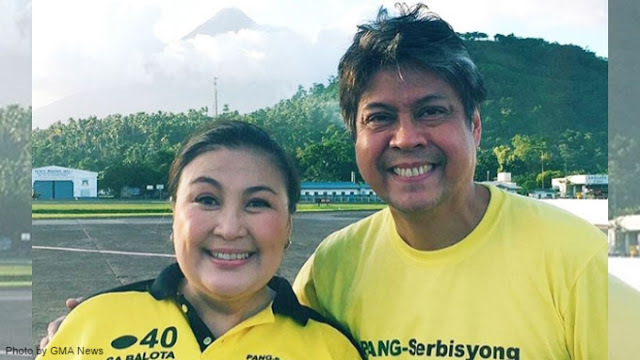 Sharon Cuneta: "I have not liked YELLOWS for years"
Actress Sharon Cuneta, wife of Liberal Party Senator Francis Pangilinan through a post in her official Facebook page made a remark which ticked the curiosity of most, as the post said that Cuneta has not "liked YELLOWS for YEARS". Attached to it are two photos of quotations that speak of a love for the color black. "Black is not sad. Light colors are what depresses me. They're so, empty. Black is poetic. How do you imagine a poet? In a bright yellow jacket? Probably not," one image read. Netizens reacted to the post and thought it threw shade at the Liberal Party. "Cguro dahil sa pdap issue eto, baka may nalaman si sharon na katotohanan ngayon lang about sa issue, kaya dumistansya cya at nagpalayo layo sa mga tao na yun na nooy pinagkakatiwalaan nya, kasi ayaw naman ni sharon ng mga ganyan," theorized a Ed Reznek, since the issue is being reinvestigated by the Department of Justice. "Aahh...now I get it! Sharon MUST have learned something about her husband's involvement (allegedly) in the Napoles list thing. That's why she is fuming mad! Remember before she said that she will give P10M to whoever can prove that her husband is involved? Now, the husband is trying to pacify her by posting that "cheesy"" Mother's Day message which she did NOT respond. Instead, she said that ONLY four people mean the world to her! I'm just reading between the lines people," said a Vangie Geronomi. Lize Laigo said, "Please emphasize. Your husband is the President of LP, and they have been called Yellow, alam mo yan Ms. Shawie. Does this post have double meaning? or another post about your likes? I don't mean to judge you, I have been one of your biggest fan since the time you started your career. But lately, para sa akin, lagi may vague messages ang posts mo. Sana, this caption does not say anything about political partisan." Panglinan, the actress' husband has been recently linked to fellow LP Senator Risa Hontiveros after a photo that shows him seemingly holding hands with the female senator scattered online. The photo was later on found to be fabricated. Cuneta in reaction to the gossip, said that if she had any problems as of the moment, it does not involve a third party in her marriage.